In the amphibian world, the axolotl is the replacement-parts king. This is the axolotl, a remarkable model organism capable of complete limb and organ regeneration. This endangered Mexican salamander serves as its own NAPA store for lost body parts, able to fully regenerate limbs, tail, heart, spine and eyes — making it a model of curiosity for regenerative biologists. Most of the scientific focus to date has been on trained on the blastema, a remarkable cluster of cells that forms at the base of an amputated limb or damaged tissue and is the modus operandi for regeneration. It somehow coordinates a symphony of instructions to re-grow muscle, cartilage, bone, blood vessels, skin — all at the right place and right time to make a good-as-new limb. But scientists with the Morgridge Institute for Research regenerative biology team shifted attention to the axolotl’s embryonic origins for new clues to the creature’s rare skills. In work published in the summer of 2016 in the journal Developmental Biology, researchers looked at 17 different development stages of axolotl embryos and found a highly unusual series of bursts in changes in gene expression, followed by stable periods, that is unique in developmental biology. These “waves and troughs” of genetic change appear three times: When the genome is first activated, during formation of the early gut and during formation of the nervous system. This pattern gives scientists three hot targets for comparison to the existing bank of information on mature axolotl limb regeneration. “We have reason to believe that what’s taking place in the adult limb regeneration process looks a lot like early axolotl development,” says Jeffrey Nelson, Morgridge postdoctoral researcher and lead author with computational biologist Peng Jiang. In a sense, the adult animal may be reactivating some primal pathway in order to trigger limb formation. Jiang says the project is also unique in that axolotl early development is rarely studied. Because the axolotl has such an immense genome, it has never been fully sequenced — unlike the frog, which is the go-to model for amphibian embryonic development. This work involved sequencing experiments that allowed the team to piece together strands of the axolotl transcriptome — the messenger RNA molecules expressed in the organism — and compare them with known transcriptomes in frogs and humans. This enabled the group to align these fractured transcripts with their genetic function. Peng did much of the comparative work in collaboration with UW-Madison biostatistics Professor Colin Dewey. The group is after an essential question: When a limb is getting regenerated, what genes play a role in that process? And in better defining that process, could there be a “recipe” of sorts that could be replicated or refined in other species? That is not a far-fetched question. Regeneration is not an either-you-can-or-can’t proposition. 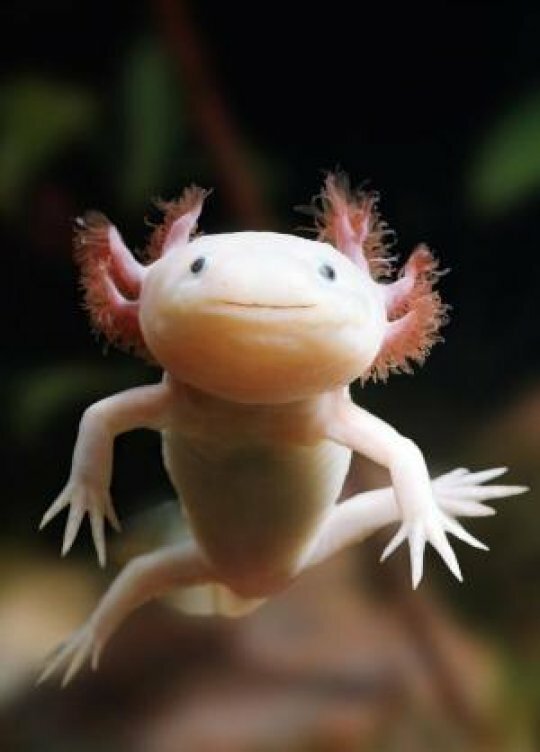 Frogs, mice and many other species have regenerative abilities, just not at the level of sophistication of the axolotl. For example, Nelson says that frogs can regenerate limbs to a degree, but the limbs grow out to a needle-like point and fail to differentiate digits. Mice, too, can regenerate the tips of their digits from the nail bed, but not from any closer to the body. “There are subtle clues that these abilities exist within other organisms, but for some reason they can’t carry out the same regeneration as the axolotl,” he says. So what’s missing with humans? Humans obviously regenerate some cell types very well, such as skin, muscle and liver cells, but almost not at all in cells of the nervous system or with any complex tissue systems. Nelson says axolotls are especially good at nervous system regeneration, which appears to play a central role in the whole limb regeneration process. Ultimately, the most fascinating question is whether science can learn something from the axolotl that could be translatable to human regenerative medicine. While still a distant prospect, it is the primary reason axolotl research is a focus of Morgridge regenerative biology, led by stem cell pioneer James Thomson. “It’s really interesting to be embedded within the context of the Thomson lab and in the whole stem cell milieu, and understanding how this axolotl might be employing the same pathways that are present in other organisms — and possibly people,” Nelson says. Web Source: Morgridge Institute for Research.